The Indian National Army of which Subash Chandra Bose took personal command, was made up from civilians and Indian Officers and other rank prisoners of war, chiefly from those taken during the invasion and occupation of Malaya. 4. Nehru Brigade under Lt. Col Aziz Ahmad Khan. The No 2 Guerilla Regiment. (Gandhi Brigade) and the Divisional Headquarter moved to Burma early in March, and after a short rest at Rangoon they started moving to the Imphal front early in April. The route and condition under which they travelled were the same as those faced by the Subhas Brigade . The Division was commanded by Major General (then Colonel) M. Z Kiani, who was undoubtedly one of the most brilliant and daring Commanders of the I. N. A. The Gandhi Brigade was commanded by Colonel I J. Kiani who was a cousin of Gen M Z Kiani. Col I. J Kiani was well known for his perseverance and doggedness. On arrival at Tamu, the Divisional commander found out that Imphal had not fallen yet and that severe fighting was going on in the vicinity of Palel. He contacted the Japanese commander on the Palel front and in cooperation with him and with Major Fujiwara (of Singapore fame) who was now a Staff officer in the Japanese General Headquarters, it was decided that the No 1 Division would have an independent sector to the west of the main Tamu-Palel road and from there carry out guerilla activity against the British forces on the Tamu front and against the Allied aerodrome at Palel. The Divisional Head Quarters were established at Chamol and the Regimental HQ at Mittong Khunou. Mittong khunou is located at the south east of Palel Airfield. Although the Japanese concentrated its main effort on the Shenam bastion itself, Yamamoto did send the 'Gandhi Brigade' or 2nd Infantry Regiment of the 1st Indian National Army Division to capture Palel from the south, the only time that the I.N.A was used in an independent role. Major Pritam Singh with a force of 300 men attack the Palel airfield on 3rd May 1944. This attack on the aerodrome came as rude shock to the British who decided to counter attack and drive back the Gandhi Brigade from Mittong Khunou. After the Palel Aerodrome attack, the British patrol activity increased very considerably. Post Palel airfield attack, the British Battalion strongly supported by heavy artillery, attacked the foremost company in the vicinity of Mittong Khunou. With propaganda weapons of loud-speakers and heavy artillery effectively to aid , the British launched a large-scale offensive. The loud speakers repeatedly disturbed the calmness of the jungle air by threatening the I.N.A. " either surrender, or else get ready to face death in the hilly area of Imphal." The loud-speakers shouted : "Gandhi Guerillas, beware ' We are attacking with big topkhana and with the superiority of arms and ammunition. If you want safety, lay down your arms in half an hour's time. Now 20 minutes are left.. Only 10 minutes are now between your life and death.'" Addressing the commander, the loud-speaker shouted : " Listen well, Commander Kiani, we will completely blow up your weak defences. We pity you and your regiment." The leading platoon of the forward company was commanded by a young Second Lieutenant Ajaib Singh who had been trained at the I.N A. Officers' Training School in Singapore. The Scottish soldiers of the Sea Forth Highlanders knowing that they were up against the I N A attacked fiercely. It was the first battle of the Gandhi Brigade against British troops, and at the very sight of them they became wild. The British soldiers came almost upon the trenches occupied by INA men, but time and again, they were beaten back with heavy losses. After their first setback, the British fell back and after reorganizing their troops they attacked again, this time supported by artillery and air support, but the gallant platoon of the I N A led by their brave commander, held firm and continued to beat back attack after attack. Eventually being unable to make any headway against the I N A soldiers, the British called a halt and withdrew to their defences. Rallying his men, and collecting ammunition from the British dead and wounded left behind by the attackers, Lt. Ajaib Singh advanced from his position and approached the nearest British defence post. Another gun battle started, this time with British on the defensive. Lt, Ajaib Singh had captured a large number of rifles and grenades in the first engagement and he use them. He fired 30 grenades using 303 rifles. Lt Ajaib Singh's small force had suffered severe losses, but he had inflicted far greater losses on the British. In the day's engagement, the British suffered at least 50 casualties, killed and wounded, while the INA losses were 10 killed and a few wounded. During that time heavy rain had set in and made the ration and ammunition supply a most difficult problem. Due to the lack of proper food and medicines, the health of the INA troops deteriorated rapidly and by the middle of June, 1944, they had become so weak that they could hardly walk a few miles, but despite this they stuck to their posts and in the face of repeated British attacks never retreated. At about this time the tide of the battle had turned. The British had managed to substantially reinforce their beleaguered garrison m Imphal, and were now in a position to launch the main offensive. Maj Gen. ShahNawaz Khan in his account of the battle wrote "Their first move was to capture the heights occupied by the men of "Gandhi Brigade" around Mithong Khunou. This time it was an attack launched by a whole British Brigade, 3,000 strong, supported by heavy artillery and aeroplanes Our old rivals, the "Seaforth", again led the attack. By a clever encircling movement, they surrounded one of our companies commanded by Capt. Rao, and it looked as if they would annihilate our force The situation looked extremely grave. All the commanding heights and strategic points were in enemy hands Besides this the strength of the Gandhi Brigade was very much depleted owing to widespread illness and battle casualties In this particular action there were 600 I N A men opposing approximately 3,000 well-fed British soldiers having infinitely superior arms and equipment. Our men fought most heroically Col I J. Kiani, the Brigade commander, himself was in the area of the company that was encircled by the British He realized that unless the strategic heights were recaptured by them his garrison would be annihilated. He, therefore, issued orders to his officers to take possession of those heights at any cost". The British force had the advantage over the I.N.A. as their defenses were at the top of the hills. The Regimental Commander, Colonel I J. Kiani had calculated that, if the I. N. A. captured the hill occupied by their enemy, it would save his whole regiment. To save the lives of 1,700, the Regimental Commander was ready to sacrifice, 300 of his men in this surprise attack. The weather was unusually bitter and the I. N. A. soldiers had no warm clothes to protect them from the biting cold. Lt. Mansukh Lall was ordered to recapture one of the heights He was commanding a platoon consisting of approximately 30 men. With this small force he counter-attacked without any artillery covering fire, and recaptured one of the strongest posts occupied by the British. While leading his small, and semi-starved force up the steep ridge, he was wounded 13 times, through exhaustion and loss of blood, he staggered and fell to the ground His men seeing their gallant commander fall hesitated and slowed down their pace. Lt. Mansukh Lall, like a tiger that is mortally wounded but is determined to make the last charge, roared to his men and exhorted them to continue their advance and not to worry about him. They were very near the summit, and making a last supreme effort, with 13 bullet wounds in his body, he rose to his feet and personally led the final assault on the height which was to decide the fate of Gandhi Brigade that day. K R Palta wrote, ". Lt. Mansukh, who was in the front line, received serious bullet wounds in his chest, thigh, arm and right hand. He fell, but rose again and again he fell. Though he was completely exhausted, he rose once again to lead his men to victory. The revolutionary slogans, the heroic spirit and the determination of our •soldiers stood them in good stead. Brave Mansukh captured the hill and waved his hand cheerfully to his Commander, who was watching the battle. The Gandhi Guerillas were saved due, to the dare-devil spirit of Mansukh, the brave I.N.A, lieutenant". Lt. Ajaib Singh was immediately sent to relieve the seriously wounded Mansukh. The first thing Ajaib Singh did was to stop the enemy observation post functioning by killing the English major, who was in charge of the O. P. He also killed two British captains who were handling the O. P. Now the British artillery was functioning blindly. The British killed many of their own men by wrongly concentrating fire on their own lines. The attack, which started at 7.30 a.m. the previous day, was over with an I N.A. victory at 4 a.m. the following day. Seventeen British officers were killed and many of their men were either killed or wounded. On the 1. N. A. side, four officers were killed and 150 other ranks killed or wounded. The Gandhi Guerillas started withdrawing on July 18, 1944. By the time they reached Mandalay, out of 94 officers, only 17 were still alive, and out of 3,000 other ranks, only about 250 Jawans had managed to survive, all being in shattered health. The rest perished either fighting for the noble cause or suffered from diseases, which they had developed on the battlefield. 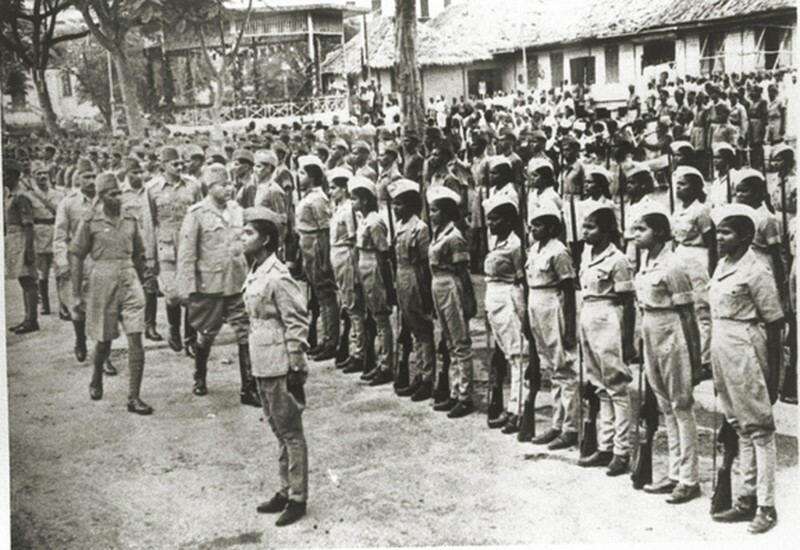 Many officers and other ranks of the Gandhi Brigade were recommended for the Shatru Nash. And many officers and men received the highest medals of bravery, the Sardar-e-Jang and, the Sher-e-Hind. 8. Lt. Lai Singh, Sardar-e-Jang. The I.N.A fought extremely well in spite of serious handicaps and lack of armament and air support. They had no plane, no lorries for transport. The soldiers themselves had to carry munitions and supplies. The Japanese Air Force gave little or no assistance. The supplies of rations were extremely irregular and several I.N.A men died of starvation. On July 17th writes Shah Nawaz " I do not know what is the idea behind this deliberate starvation of my men". When the retreat began Shah Nawaz again noted " Japanese have left us completely in the lurch. They are running away themselves and are not bothering about us'. This article was webcasted on April 13 2019.